Home › Archaeology › What About Other Religions? The world is full of religions. Most people adhere to a predominant religion of their family or surrounding environment or culture. When I was in elementary school everyone around me in southern California seemed to be a Methodist, Presbyterian, Catholic or Baptist. While my family did not attend any church, even on Christmas or Easter, I always wanted to belong to one of them, just to belong. I personally liked the sound of “Methodist” but had no idea what that “religion” or any of these really were about. Of course all of these are denominations of Christianity. Since those days of my youth, the religious landscape has changed over the past 50 years in the US and the world. It would seem that the world is fairly confused. Almost 1 billion people don’t want to bother understanding or have given up (Atheists and Agnostics/Non-Religious). One third of the world is Christian, or some derivation of it. Almost one quarter is Muslim and growing rapidly. Another way to look at it is that over 88% of the world’s population claims to identify with some religion. Can they all be right? Who wins? Who’s right? Does it really matter? Yes, it does matter. There is something of substance to all of this attraction to religion though people are confused and misguided. And it is not “the opiate of the masses.” Only callous fools would dismiss or diminish man’s quest for real truth. Throughout human history there is record of man’s search for meaning and understanding. Religion is man’s attempt to explain and approach a higher power they acknowledge exists but must climb their way toward. Interesting that, apart from Christianity, they all possess a works-based foundation or approach to the deity. Islam – origin: Mohammed, AD 570-632. Each person must take care of his/her sins, each must earn their own salvation. Jesus was a prophet and lesser than Mohammed. God is Allah, not Father. Believe that Christ did not really die on the cross. Hinduism – origin: no founder; 2000 BC polytheism (ancient Vedic/Sanskrit literature). We are all divine; each must seek deliverance from endless cycle of death and rebirth through union with Brahma, which is achieved through devotion, meditation, good works and self-control. Believe that Jesus is not God but just one of many incarnations of Hindu deity. Buddhism – origin: Siddhartha Gautama, 560 BC. Became known as Buddha. Path earned to salvation/nirvana through right living. Jesus is good teacher but less than Buddha. Seek to rid themselves of lustful desires through self-effort. Judaism – origin: Abraham and Jewish patriarchs, 2000 BC. Foundation for Christianity yet separate on issue of Jesus Christ as Messiah (because he failed to deliver Israel from their oppression). Man is not born good or evil; salvation is gained through commitment to God and through moral living. Mormonism – origin: Joseph Smith, 1823. Claimed angelic revelation. Believe God is an exalted man – “As man is, God once was: as God is, man may be.” Started out monotheistic, became polytheistic. Firstborn creation was Jesus. Salvation comes from obeying the Church of Latter Day Saints. Jehovah’s Witnesses – origin: Charles Taze Russell, 1879. Do not believe in the deity of Christ, atoning death, or that Holy Spirit is God. Adhere to teachings, decisions, and scriptural understandings of the Watchtower Society. Salvation only for Jehovah’s Witnesses. 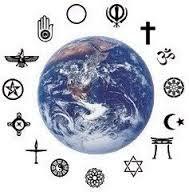 Except for Hinduism and Buddhism, all of these religions have direct ties to Christianity. Even Hindus and Buddhist must deal with “the Jesus Question” and simply acknowledge him as a good teacher, but not God. Of course, the Judeo-Christian ethical standards are rooted in the Old Testament scriptures, which cite the origin of the Arab nations (see story of Hagar and Ishmael in Genesis 16) which begat Mohammed and ultimately Islam. Mormonism and Jehovah’s Witnesses are derivations of Christianity by dubious self-prophets. Christianity’s origin is Jesus Christ whose death and physical resurrection in AD 33 stirred a spiritual revolution in Jerusalem that spread from there to around the world. The Old Testament is the lead-in to the advent of Christ; the New Testament is the documentation of the meaning of His story and purpose of life and mankind. The world has never been the same since the intersection of God incarnate in Christ and the release of the Holy Spirit shortly after his crucifixion and resurrection from death. Wars, nations, politics, evil, corruption and great benevolence have been experienced throughout the world over the past 2000 years as a result of Christianity. Evil distortion and corruption does not make it wrong, but rather speaks to the free power of man to choose his own path and either accept, reject or manipulate the Truth before us all. Christianity holds up One God who is supreme, sovereign and transcendent. God came to earth in the form of a man, Jesus, as savior to rectify a broken relationship between man and his Creator. Like it or not, Jesus is the one way, the only way. Don’t discard Him out of your personal sense of fairness. Seek and find understanding through Biblical scripture and humble submission to something greater than any religion. Do you know Truth or merely religion? ‹ Hearing God? Yeah, Right.